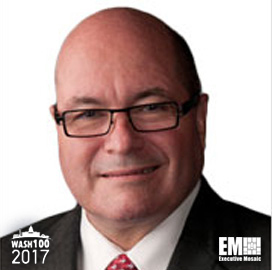 Executive Mosaic is honored to announce Brian McKeon, an executive vice president at Booz Allen Hamilton, as an inductee into the 2017 edition of the Wash100 — Executive Mosaic’s annual selection of influential leaders in the government contracting arena. McKeon is responsible for the McLean, Va.-based government services contractor’s systems engineering and integration business with a focus on command, control, communications, computers, intelligence, surveillance and reconnaissance for the U.S. Army. In January 2016, Booz Allen announced a potential five-year, $159 million task order to provide systems engineering services and help streamline the U.S. Army’s tactical and data network systems. McKeon said then that the award seeks to reflect the company’s investments in cyber and engineering capabilities in support of the service branch’s Project Director, Network Enablers office and its tactical network. Two months later, Booz Allen announced a $20.2 million contract award for programmatic, technical and sustainment support to the Army project manager for tactical radios and associated product management offices. “This award reinforces our communications market strategy,” McKeon said. Prior to his 2011 appointment at Booz Allen, he served as VP and general manager of Raytheon’s integrated communications systems business unit. He spent more than three decades at the Waltham, Mass.-based defense contractor and held senior leadership roles such as CEO of Raytheon Systems Ltd. and chairman of the board for a joint venture between Raytheon and Thales. McKeon served as chair of the Intellect International Defense and Security Council and board member of the Society of British Aerospace Companies. Executive Mosaic congratulates Brian McKeon and the Booz Allen team for their selection to receive this award.